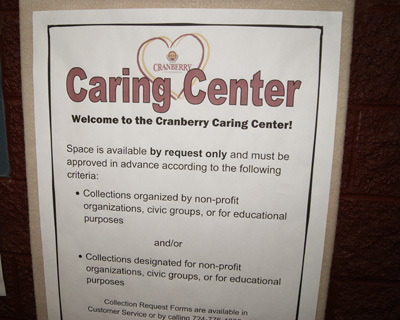 The Cranberry Caring Center is a designated area in the Cranberry Municipal Center for collection by or for non-profit organizations, civic groups, or educational purposes. Space is available by request only and must be approved in advance. In order to submit a request, fill out the Cranberry Township Caring Center Collection Request form below. Return the completed form to the Parks & Recreation Customer Service Desk in the Municipal Center.